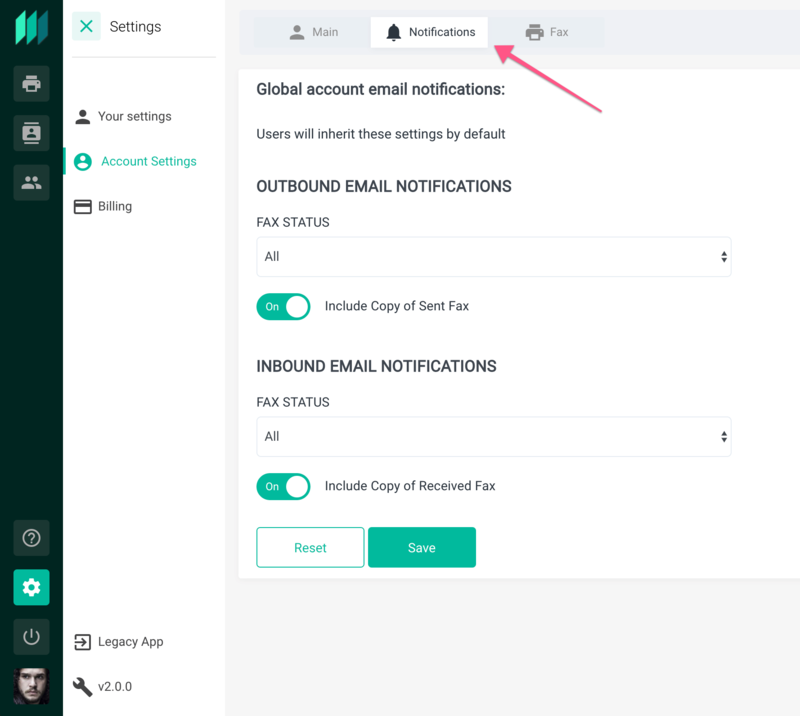 Admin users have access to global account settings in the user interface. 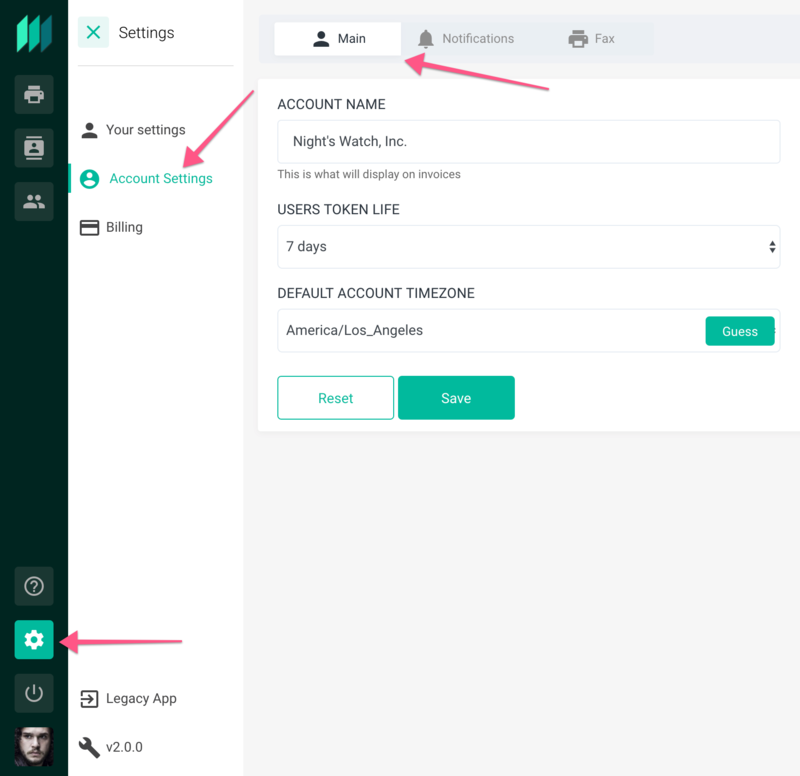 The first tab is Main where you can set basic information including account name, token life for users (how long before they are auto-signed out of the app for inactivity), and default time zone. The next tab in Account Settings is Notifications. This is where you as the admin can set the global default settings for email to fax notifications for all new users. This can be changed at the user level. The next tab is Fax. This is where you can set the Global Caller ID and enable or disable email to fax functionality as well as fax attachment permissions. These settings are mostly for customers in tightly regulated industries and this feature set let's you administer accordingly and stay within regulatory guidelines. 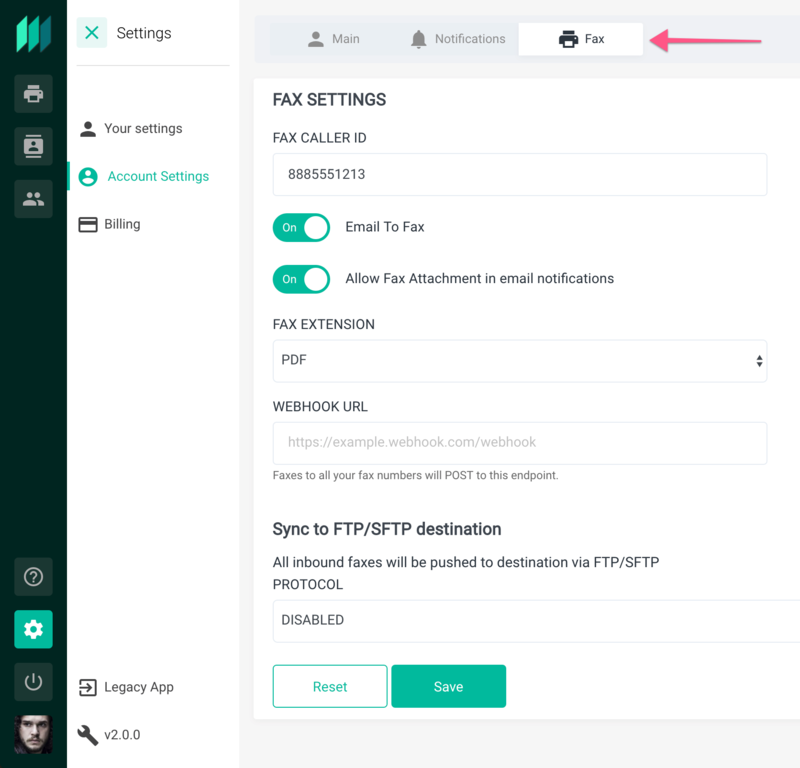 Lastly, there is a setting allowing you to set your fax extension file type (PDF or TIFF), another to set up webhooks, and finally a setting to enable FTP/SFTP routing for incoming faxes. Another setting unique to the admin is user management. This is accessed by clicking the User icon in the main nav. This screen gives access to view and edit information for all users in the account as well as the ability to create new users. Admins will also have additional settings and management items available under fax settings. These are accessible by clicking the Fax icon in the main nav. The first of the admin links is FaxBridges. 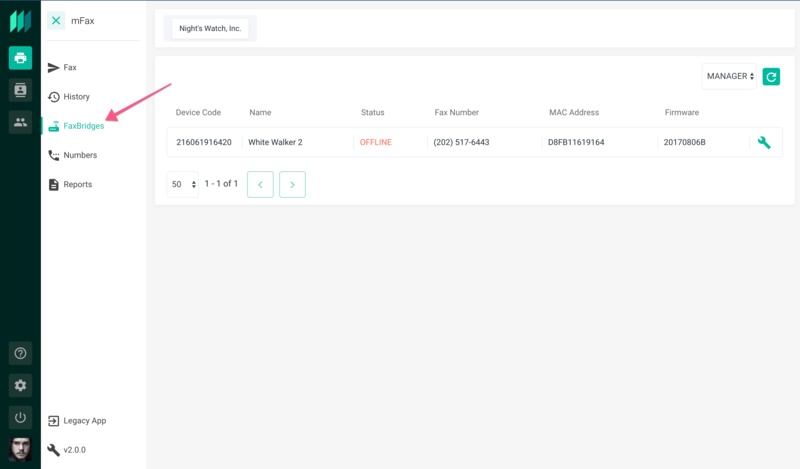 This section will allow you to administer and view settings on any FaxBridges you have in your account as well as see which units are online. The next link is Numbers. 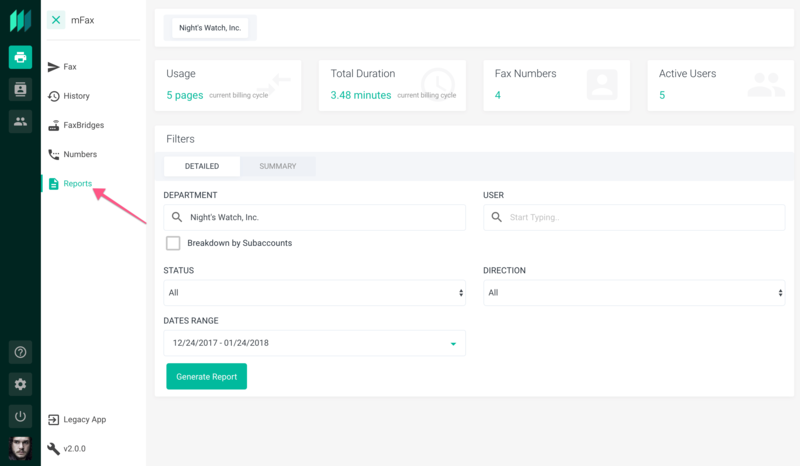 Here you are able to not only view all of the fax numbers associated with your account but also assign and/or change numbers associated to chosen users. You can also provision new numbers to your account in this section. Lastly, is the Reports link. 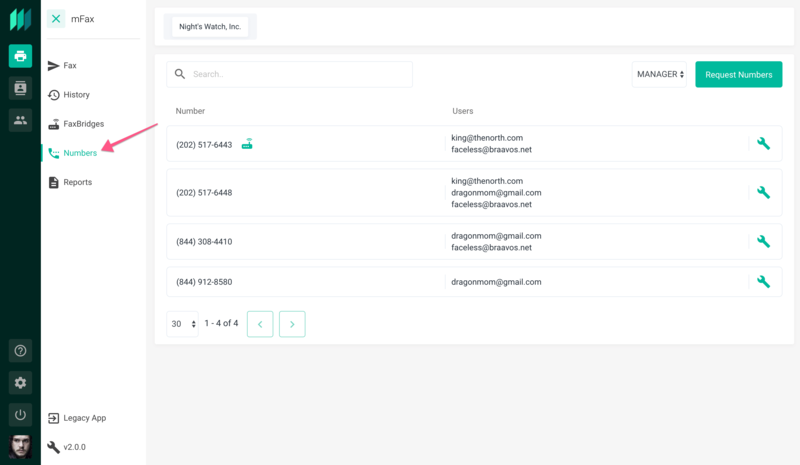 This is where you will see a snapshot of your monthly usages including pages sent and received as well as the duration. 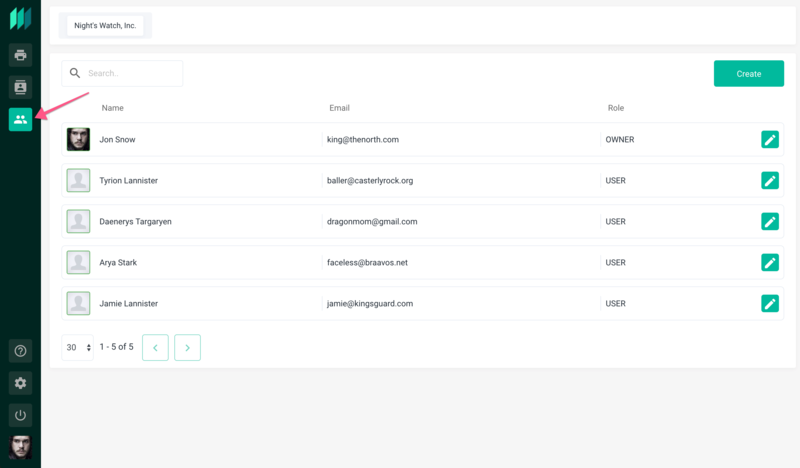 You are also able to run detailed usage reports for any or all of your users and/or sub-accounts. All reports are also downloadable as CSV files for your convenience.